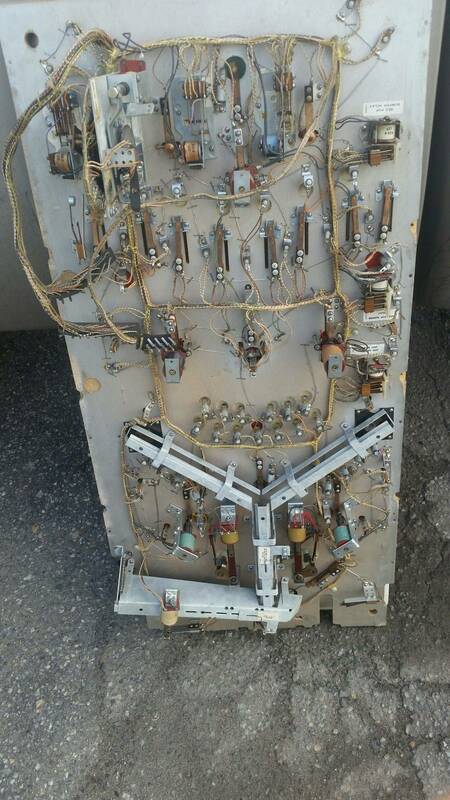 » Forum » Electro-Mechanical » EM Pinball Hangout » Have you ever found an EM pin in the trash? » Have you ever found an EM pin in the trash? Have you ever found an EM pin in the trash? Someone in another EM thread posted photos of a Williams "Shoot the Moon" which was picked up from the trash. We all know Tommy got his "Kings & Queens" at the top of a junk pile. I got my second pin ever, a Gottlieb "Play Mates" from the trash around 1989. It was all there, but disassembled, and in fairly rough condition. Once saw a Gottlieb "Spin Out" in the trash. It was really rough. I told my brother about it, and he went and got the head. Anyone else care to share their "trash" pinball finds? I saved my very first game, a Gottlieb Spirit of '76 from the trash in 1988. I was studying Electrical Engineering at school and that year was a practical year for me, experiencing working at companies as a "rookie". One of my teachers had to go home early, because he needed to bring a pinball game to the trash. In stead of bringing it to the trash, he brought it to my home. Fortunately my mum wasn't at home, and at the time she was, it was already at the attic. No way back . I still own the game. I found an f-14 in a dumpster 20 feet from my front door once. I once saw an EM pinball machine trashed. It was at a laundry mat. Vandals destroyed the machine my friend and I would play waiting for the Pizza Joint to open. Name of the game was Dodge City. That reminds me of a sad tale about a year and a half ago. Someone posted something about a Gottlieb "Subway" which was in a dumpster in Brooklyn. 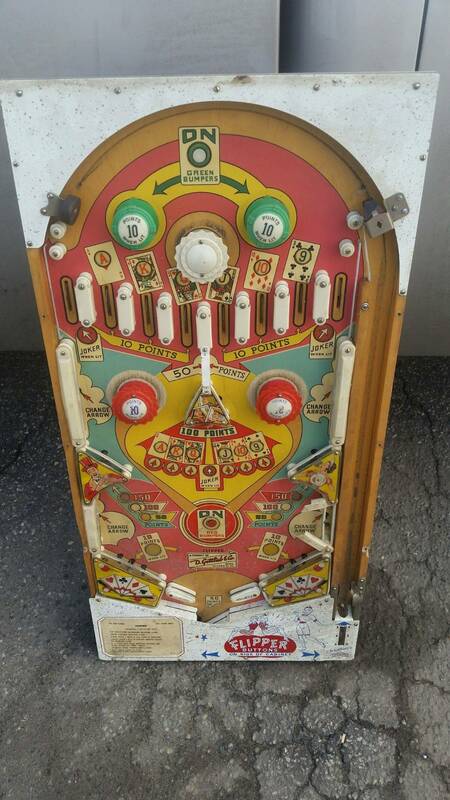 It had a nice playfield and backglass, but had a painted up cabinet. I really wanted to get down there to rescue it, but just couldn't swing it. A day or two after first hearing about it, I remembered a pinball guy I know who lives in Brooklyn. I called him, and he said it was about 20 minutes from him, but he would go and check it out. He did, and reported back to me that the game was smashed and buried by heavy construction debris by the time he had arrived. He sent a couple of pictures he took of a few pathetic remains that were left on the curb next to the dumpster. It was disheartening, but I learned later that someone apparently rescued the backglass and some of the head components; maybe the entire head insert. I think the guy tried to sell these parts, but wanted an outrageous amount for them. I don't know who this guy was, or if he still has this stuff. I'm jogging my own memory here, as I know someone who got a call once that a family who was moving out of their home were putting a lot of stuff out to the curb, including a pinball machine. The guy drove down there, and got a near mint Gottlieb "Mustang" which would have been trashed. I think he still has it today. Not your traditional EM but I did find a 1941 Stoner Sara Suzy pre-war in the trash one night. Still have it.. One of these days I will get it working. It always seems to find it self getting moved to the end of the line of projects. I uploaded the pics to IPDB because there weren't any. I thought it was a cool find. Growing up in the 60s on Long Island, we had a Massive Moving Storage Company Nearby. 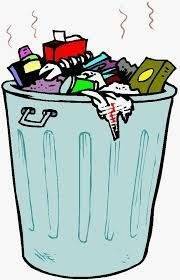 Once a month, unpaid accounts would have their possessions moved to a commercial curb for disposal. It was always the first Monday, and I learned the timing to be there first as a second grader. Adult stuff, other than Playboys, I had no use for. But Comic Books, TOYs from the late 50's, weird stuff, and an occasional Pinball was on the Curb! My favorite story was dragging a wood rail back home, hoping the legs dont break, through a 6:30 AM snow storm! Most of them, my father gave away....he was old school. It wasnt I turned 13, that I was allowed to keep one! I remember one tossed, a mechanical, that was late for the trash, and the neighborhood kids played it in the street until dark. Here is a shot of the Shoot the Moon mentioned above right after picking it up next to a dumpster. That is my father-in-law standing next to it. As you can see, the coin lock was substituted with a wooden dowel and square handle. They picked it up assembled, put it in their pickup and put it in their garage. They had no idea on how to break it apart or transport it so the balls were rolling around inside of it. It had no leg levelers. 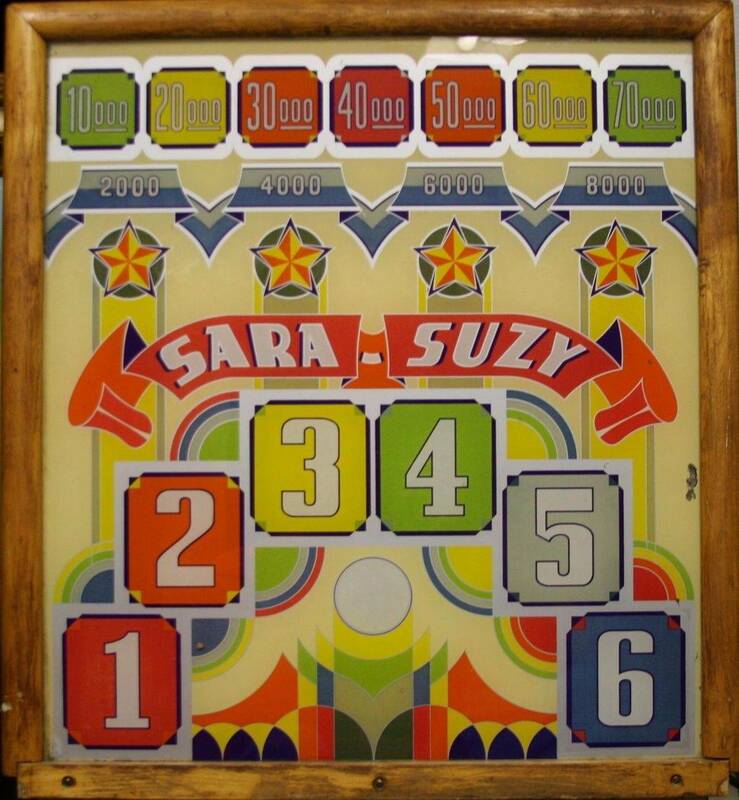 The backglass was almost perfect, the playfield nice, the cabinet paint all original and super nice and it actually semi-played. I wish I could find any pinball machines in the trash..... I suppose this only happens in remote places and under-developed areas. In large cities, you never find anything of value. I have never found a pinball in the trash. In the other thread I mentioned the gentleman from Ca that told me he found a Nags at the curb. Years ago I was at the local dump and there was a sign there about a designated area for appliances. On the sign it also mentioned pinball machines. This may have been before I was even collecting, but I was a little dumbfounded that people threw away enough pinball machines, that they would be included on the sign. So I would imagine there are a few buried in there. I found a Bally Flip Flop sitting out by the curb on trash day. Everything in excellent condition! EXCEPT...the ham hands owner CUT all of the wires between the head and the body to get it disassembled....I guess he didn't see the plugs. I never did get it working and eventually stripped it for parts. As it turns out, multiple wire colors are reused over and over again in the wire bundles and the possible combinations of re-connecting them seemed endless. After a few days trial and error, I gave up. Too bad. The F-14 in the dumpster was on 10th avenue in front of my apartment, three blocks from Times Square, so that's really not true! Game was complete except for the speaker panel and translite. I ended up stripping it more or less right there, hailing a cab, and bringing it to my shop. Took the playfield and head. It had some cut wires (they removed the head) so I decided I'd use it for parts rather than restoring it, though that certainly would have been an option for someone with more patience. I ended up using every single board in the head for a project Cyclone (they all worked!) and to this day (10 years later) I still get valuable parts off of that F14 playfield. I think I sold the beacon assembly to someone. Not an em but I did grab a nice Gottlieb Pinball Pool at the curb one time years ago. Years ago I was at the local dump and there was a sign there about a designated area for appliances. On the sign it also mentioned pinball machines. Now that would be a sign to have Sad, but cool at the same time. My wife and I, and another two local collectors, pulled a Judge Dredd out of a dumpster. 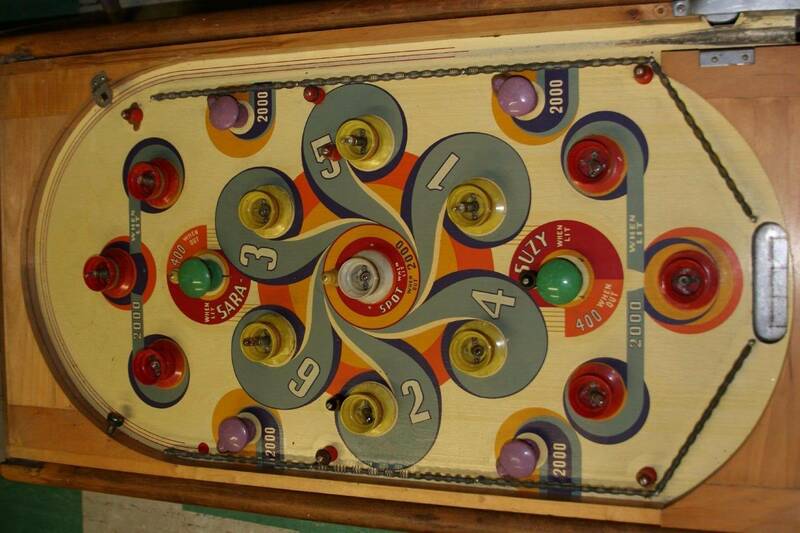 The playfield had been removed, but everything else was there. We stripped it clean and let the cabinet go to the landfill. I took all the boards, the DMD, the backboard lamp board and wiring harnesses. The other guys took all the cabinet hardware, speakers, coin door, etc. This was a good while ago, but still have the wire and light board. Wires are definitely going to get used in my project that I want to do..
Wow, what an neat thread! This is the kind of stuff I'm hoping to hear about. Putting my name out there so hopefully if this ever happens near me I'll be able to snag it! In the case of the F14, contractors were cleaning out the basement of a building next door to me and this game happened to be in it, simple as that. I don't think it's always "so rich they don't care," it's often "I'm moving/renovating etc. and this old thing is taking up space and we need it out." The contractors actually helped me load the parts into the cab and went to the basement to grab the head for me, I bought them a six pack of beer. I also once found a gottlieb widebody (I think Panthera but still don't really know) cabinet on the street, but it smelled like dog piss. I did remove the boards and displays and still have them but I've never needed them. Well that makes sense, I have heard of that too, or families who are unloading an estate and just need everything gone, useless they don't even realize there is any value. Found A Chexx hockey on the curbside trash about 7 years ago. Dome was trashed but everything else was there and it worked! I never found one in the trash, but I did get a Williams Liberty Bell for free. I went to a lady's home to look at a Flipper Clown she was selling. The basement was a disaster, with crap everywhere and smelling like mildew. The Flipper Clown was salvageable and I made a deal for it. Then she says "what about the other one?". What other one? I look over and see a mound of dirty laundry that was hiding a pretty trashed Liberty Bell. I looked it over and said "not interested". Then she asks me if I will haul it away for her. Since I was alone and there were stairs, I again replied "not interested". Eventually she said take them both or take none. So I took it. Just recently, I fixed it up and gave it to my grandkids for Christmas. They were thrilled. My flash was on its way.. it was in rough shape.. if I didn't score it for short money the dude was gonna put it in front near his dumpster.. for short money eyes I replaced and fixed it up.. plays great .. I was at he grocery store one time and a scrappers truck drove by me and my wife with a machine laying on its side. I was yelling at my wife to load the bags in our truck faster so I could catch him. I lost site of him and never saw it again. When someone breaks your toy, you go out and get another. In this case, it took about 40 years to do it. I love my Dodge City. About 5 house down from where I live was a Jive Time someone was getting ready to throw away. Unfortunately someone beat me to it. You mean you continued to load groceries?... I'd have taken off after that truck and pick up dem groceries mo layduh! Or alternatively just throw the entire cart into the back of the truck, groceries included and just return the cart later. Just tell them it wasn't theft, it was a pin-megency and you had no time to lose to save the patient. Don't know if it counts but my Star-Jet I'm piecing back together we all know and love was parted out and the cabinet was trashed. When I knew I was buying it I immediately had him dig the backbox light board out of the actual dumpster because I knew I would never find another one of those, thankfully the trash hadn't been picked up yet. Not exactly the trash, or free, but did save it from then-imminent non-existence. Wow, what a shame the rest of the game was trashed. 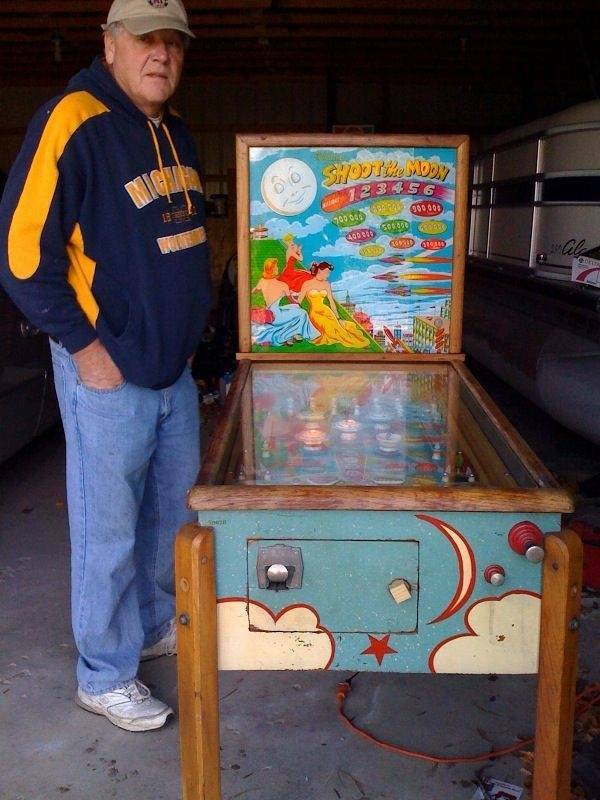 Nice grab on that really nice "Flipper" playfield though. I think there was a difference between the woodrail version and the metal rail version on the playfield. Something to do with those white plastic strips along the edge of the playfield. I think this one is a metal rail cabinet. The plastic strips were white on those, but red on the woodrail versions, I believe. IPDB shows red ones on the sample woodrail, but who knows with the normal production models. Flipper (and ONLY Flipper) came in both a woodrail cabinet and a wedgehead cabinet as it was smack in the middle of that transition, so it definitely could have been! My 10 year old just spotted an original space invaders under a tarp on a porch. We may stop and see whats up with it...... I raised him well. Get over there before its gone.